Lasalle Fish and Wildlife Area for a walk and a swim in the Bayou. If we're lucky there will be a few migrating waterfowl using the bayous, resting before they continue their flight to Canada and all points north, east and west. Ranger's on the lead, the cameras are packed, and we're ready to hit the dirt running. Before I go any further, I must warn you that this time of year, March thru May is Turkey season. Hunters are in the woods hoping to bag Big Tom Gobbler. So before you start stomping around at a Fish an Wildlife Area, go to the Headquarters and ask about their restrictions and rules at that property. If there are turkey hunters in the woods, I would not enter. Give the hunters the woods, the seasons only about a month in most states. 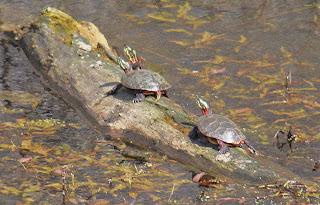 Sunning on a log are three Painted Turtles (Chrysemys picta) . These pics are taken mid to late April, still fairly cold. Low temps at night may fall to the mid 20's, day time highs may reach 50 degrees. But as the sun rises higher in the sky each day, the sunrays warm the plants, logs and mud in and under the cold water. Turtles being cold-blooded, spend the winter hibernating in leaves and mud under the water so they don't freeze. The warm sunlight wakes the turtles from their sleep. On a sunny day the turtles will congregate on a toasty log, soaking up the spring sunshine. What on earth is this! This is what the hunters are after, a 20 lb Tom turkey. 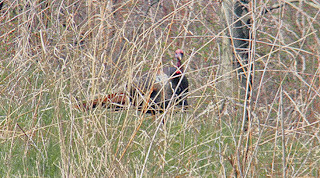 The Eastern Wild Turkey (Meleagris gallopavo) are a native bird, but the turkeys we see now were reintroduced to most of their original range because the original turkey population was exterminated from most of the Eastern United States. This bird has a "beard" consisting of modified feathers that stick out from the breast. His beard is about 9 inches (230 mm) in length, about average. I know, hard to see this turkey in the straw, well click on the picture and you'll see an enlargement. Maybe you can make out the beard, it hangs from the front of his breast. Can a 20 lb Turkey Really Fly? You betcha! 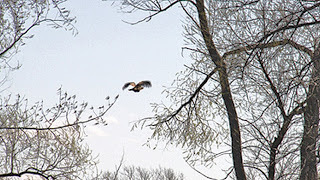 Here's a couple pictures that demonstrate that a Wild Turkey is a strong flier. get to close they will flush(jump up into the air) and fly away at full speed. It will scare the bejebees out of you! 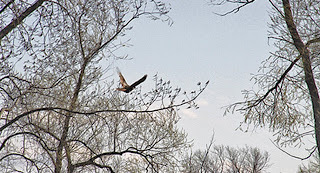 Seeing a large flock of Wild Turkeys flying through a dense oak woods is an amazing sight. We're facing north, looking over a flooded corn field. This is a part of the Baker Unit. Corn will be planted at this site (if the ground ever dries). The corn will provide food and cover for the migrating waterfowl next fall and winter. In this unit there are three duck hunting blinds. Hunter get up in the middle of the night, just to stand in line, way before daylight. Hoping to be lucky enough to get the opportunity to duck hunt the Baker Unit. Great blog! Keep it coming!